POWER LINK's ROGUES GALLERY SITE. 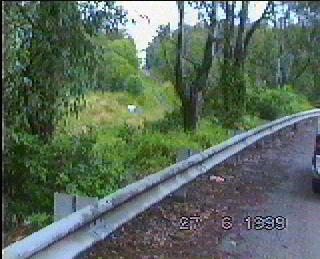 During the last months of 1997 a POWER LINK Public Notice was noticed which was unable to be seen by passing motorists announcing a future power sub-station at Lytton Road Murarrie. After raising the matter with Power Link several times the sign was eventually moved to face Lytton Road unfortunately that position was approx 100 meters behind a two metre high overgrown chainwire fence. The position to which sign was moved made it impossible to be read from the public road. The sign was still hard to even see by passing motorist on Lytton Road. 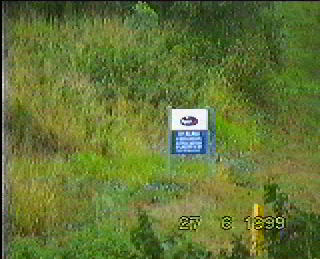 I was able to have Brisbane Extra a Current Affairs Channel 9 TV program highlight this sign on 2 March 1998. The sign is presently almost un-noticeably to any passing motorist and definately unreadably by any motorist even if they did see it and walked to the edge of the road. The second image is at 10x zoom. Pictures taken from the only position the sign was visible from Lytton Road. date stampted. If a public sign is not able to be seen and read easily then the ethics of the installer must be in QUESTION! Our group now calls upon POWERLINK to either move the sign to the existing fence alignment or massively increase its size so it can be seen and read by the passing public without any further delays or excuses. Is there a link between high voltage power lines and some childhood medical problems? Press to see link page.